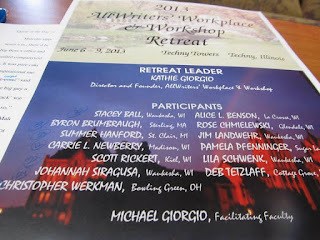 I spent this weekend among the AllWriters' Workplace and Workshop community at their annual writing retreat. It is held at Techny Towers in Illinois, near Northbrook. I always come away from this retreat exhausted, but satisfied. While there are some lectures and workshops, much of the retreat is spent on just personal writing time. I felt like I got a great deal done. Could I have written more? Probably, but it wasn't for lack of trying. I learned a few things over the course of the weekend. Just because it's a writing retreat doesn't mean your work has to be all new material. I am unsure where I got the mindset that only new material is worthy of my time at a retreat, but I need to shake it. Rewrite is as important as the original material. I'm reminded that rewriting is "new material" in that your changing something into something new. If you're given a boring prompt, just run with it. Today's exercise involved using a fortune from a fortune cookie as the first line of a story. Mine was "You always bring out the best in people." I thought this was a crappy line to start with. For 3/4 of my story I thought the story was going nowhere. I thought I'd get to the end of the time limit and have a winding story that went nowhere and had a lousy ending. Along the way something came to me and I ended up with a pretty decent story after all. It was a case of write as far as your headlights and eventually it will come to you. Everyone is at a different level, but EVERYONE has something to say. The group had beginning, experienced, published and non-published writers. It was interesting to see some of the beginners get praised for really good stuff at the same time some of the experienced people took some lumps. (Including me, though I don't consider myself very experienced as yet). No one takes the critiquing personally, so it's all good. We're all there to help. It's a workshop, not a lynch mob. Everyone has a different writing niche. It was a fascinating study in social interaction from a writing environment perspective. Some people wrote in public areas, some wrote in their room with the door open, some in their room with the door closed (me), and some wrote outdoors. Again, no one took offense at the others' style or preference, because we all have different needs. I happen to need complete seclusion (if possible) while some need to be around others. Yesterday's block was yesterday. While I never had complete and total "writer's block," there were days where things just felt forced. If you write, you know all about these days. On Saturday, after two days of floundering, I went outside and wrote. I suddenly hit a zone and it all came naturally. I love those days, but I also realize sometimes it takes a Thursday and Friday of struggling to make a Saturday of ease. Words are the hidden value of a retreat. One of the things I love about this conference is that it is such an encouraging group. People may beat you up a bit during your critique, but it's only because they care. I had at least four people come up to me over the weekend and say how much they enjoyed my writing. You cannot put a price on that. Writers need to hear this, love to hear this. It is a huge part of why we work at it like we do. When you think your book or story has the perfect ending, think again. So I thought I had the perfect epilogue to my BWCA book submitted for critiquing this weekend, and after my peers assessed it, what came out were three things. 1. It's not done. It needed more emotion among several other tweaks. 2. It's not the epilogue. After much discussion we determined that it should be the last chapter, not an epilogue. 3. The ending is not the ending. Even if I move this to the chapter, it is still not done. I need to finish this story and then make it the last chapter. Crossing genres is a good way to keep it fresh. The writing prompt is my new friend. Flash fiction writing exercises are a great way to get a story started. They are also a great way for me to stretch myself stylistically. You only get better at what you don't know by "going there." I plan to go there more. There's no place for regrets. I tend to dwell on the fact that I wasn't writing 20 years ago. I've always enjoyed writing and was always pretty good at it, but only started taking it seriously in the past 5 years. I need to let those years go and be happy I'm writing now. Writing today. Don't write to a market. Rather than looking for what people are looking for, maybe we should just write and worry about finding a place for it later. Our work will be better and we won't feel shoved into the confines of a market box. These are just a few of the many things I learned this weekend. I'm always amazed at what I take away from this event. I can't wait for the next one. Write on. Jim, it was a pleasure to share the retreat experience with you and our fellow writers. I so enjoyed getting to know the people behind the stories.